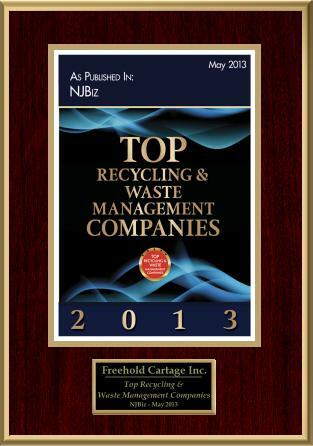 Trash & Recycling | Freehold Cartage Inc.
FCI operates a recycling processing facility at its Freehold, NJ location. 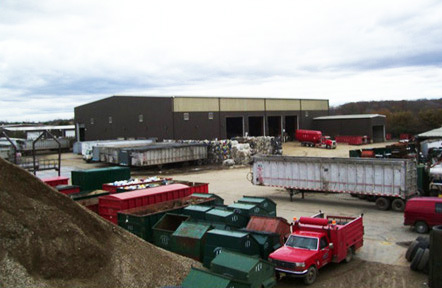 The facility has been in operation since 2003 and processes both Class A and Class B recyclable materials. Class A materials include glass, plastics, aluminum and other metals, papers, and cardboard. Plastic bottles, aluminum and metal cans, paper and cardboard are all compacted and baled before being shipped off site for reuse. Other materials are containerized and shipped off site for beneficial reuse. Class B materials include wood, brush, stumps, tree parts, concrete, brick, block, asphalt and tires. The wood products are ground down into either wood chips, or mulch with some topsoil being recovered in the processing as well. Concrete, brick, block and asphalt are all pulverized into a crushed concrete product. Tires are containerized and shipped off site to a recycling facility. Our wood chip, mulch, topsoil and crushed concrete products are for sale to the public and available at our Freehold, NJ location. Did you know typical household trash contains only about 10% of non-recyclable materials? About 80% of the trash an average household generates is recyclable paper and cardboard and another 10% is a combination of recyclable glass, plastic and metal containers. Think of how much landfill space would be saved if we put forth our best efforts to recycle!! While our trucks are RED, we are GREEN.